Here's a photo from my parents' visit over Easter. That's Dad, curled up at the top with a headache, and Mom, keeping her distance. Oops! That's not my parents, silly. How did the catties get on the guestbed?! Well, I never! But seriously, now they're gone Georgianna especially is missing her g-p's hanging out with her during the day while I bring home the bacon from school. 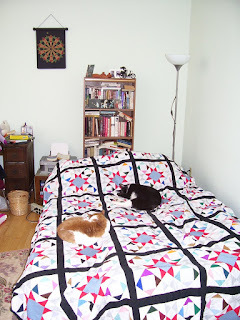 And the catties' grand-p's were very nice not to mind sharing the bed (as long as both pairs weren't in it at once). Georgianna was confused about someone else sitting in her Ikea chair every day, but overall everyone got on swimmingly.